In the essay on ‘Colonial Australian Wines’ the ravages of mildew on the European vineyards in the 1850s is graphically described. Mildew was also a problem in New South Wales vineyards but not usually with devastating effect, although it did cause a number of small vineyards to be abandoned in the early days of the colony. William Macarthur, writing as Maro, discussed ‘the blight’ at some length in 1843 in Letter IV ‘Diseases of the Vine’, and drew the conclusion that it was ‘the effect of a minute parasitical fungus, somewhat analogous in its habits to the one commonly known by the name of “the rust” or “mildew” in wheat.’ Even at that date this was a contentious proposal but more than twelve years earlier the germ theory of disease in plants and animals was very much in its infancy and was not even considered as a cause. Letter from ‘Bacchus’ on vine blight – Sydney Herald Monday 25th of April, 1831. Bacchus’ letter, written in response to an earlier one from the nurseryman Thomas Shepherd, is lengthy and I have only included sections which appear to me to give the gist of his argument and which also provide useful information on grape and wine production at Camden Park. It is unnecessary to provide Shepherd’s original letter as Bacchus gives an adequate synopsis. ‘The growth of grapes being an object of undoubted importance to the colony, every discovery of the causes of failure, disease, or better mode of culture of the vine, affords a valuable accession of knowledge; and the individuals who publish their discoveries are entitled to the thanks of the community, and should be encouraged to proceed in their observations. But whilst practical men should be solicited to benefit the public with the result of their experience, they should be very cautious how they advance theories, which have not been confirmed by a long course of actual observation. Bacchus goes on to discuss the alternative theory that ‘the blight may still be occasioned by the effect of the sun’s rays upon the dew drops, notwithstanding anything in the learned gentleman’s dissertation to the contrary’. He then briefly outlines Shepherd’s theory and proposed prevention. The rest of the letter provides examples of productive vineyards that do not appear to fit Shepherd’s theory. Included are examples of vineyards that are affected with blight when they shouldn’t be, and others not affected when they should be! But only the Macarthur’s vineyards at Parramatta and Camden concern us here. ‘I have had an opportunity of noticing the growth of the vines in Mr. M’Arthur’s [John Snr.] garden at Parramatta, where several varieties are cultivated in different ways, but they are all more or less subject to blight; although any one acquainted with the situation of that gentleman’s garden, will I think, be of opinion, that for its natural situation, as well as from the shelter afforded by full grown fruit trees, it is better screened from the southerly winds than could be effected by any artificial plantation after many years growth, but even in a situation so favourable, according to Mr. S’s theory, they are blighted. It may not be generally known, but it is worthy of extensive dissemination, that Mr. M’Arthur’s vineyard at Camden [presumably the first vineyard – 1820], is situated on an easterly aspect, and yet I believe there has been a more abundant crop of grapes in that vineyard this year than in any other in the Colony. To view the entire letter in the Sydney Herald click here. This is again a lengthy letter, much of which is a defence of his reputation against the somewhat unfair charge that ‘his standing in the Colony, or his opportunities of observation have been such as to warrant his arriving at’ the conclusions that he did. In the course of the letter he discusses his own theory at some length, being careful to explain that other causes may operate in some circumstances. However, the portion that concerns us is quite brief. ‘As to the vineyard at Camden, although it is planted on an easterly aspect, it is sheltered from the southerly winds, by a hill behind it, which continues at least a mile beyond its scite [sic], and the ground has been prepared by proper trenching; besides, the varieties of grapes which Mr. M’Arthur has planted, are well selected for the climate, so that I am not at all surprised at the abundant crops which have been produced in that vineyard. To view the entire editorial in the Sydney Herald click here. Nothing more was written in the Sydney Herald for nearly a year. It seems that Thomas Shepherd’s views prevailed, although what William Macarthur and ‘Bacchus’ thought of it we may never know. This ‘solution’ to the problem of blight certainly didn’t prevent Macarthur from enquiring more deeply into the problem. Only the opening paragraph of the editorial is given here. To see the full editorial click here. 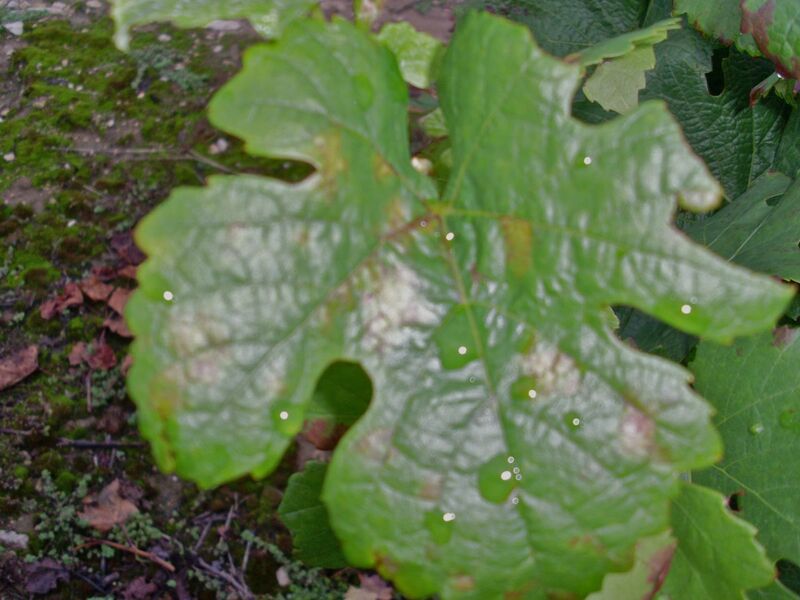 This image, somewhat out of focus but the best I can find, is taken from Wikimedia Commons and shows a vine leaf infected with mildew. Attribution, http://www.kvins.com (originally posted to Flickr as Mildiou) [CC-BY-2.0 (http://www.creativecommons.org/licenses/by/2.0)], via Wikimedia Commons.